Turley Graduating class of 1946, Editor Turley Heritage Days Publication 1983. Turley Lions Club. Chairman Research on History of Turley, Oklahoma. 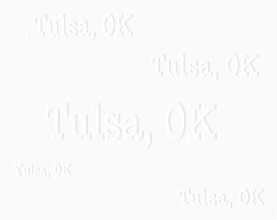 Turley is an old town located in the area of 61st St North and Peoria in north Tulsa, Tulsa county, OK. The town itself is on the west side of Peoria between north 61st and 62nd streets and runs back west to the railroad tracks. Downtown is located on 61st street on the west of Peoria. I can remember the old post office, Dr. Short's office and several stores in the downtown area. There was also a row of businesses located on the west side of Peoria across the street from the school. I had aunts and uncles who lived in the "city limits" of Turley. I would guess that Turley ran on north past Bird Creek until it ran into Sperry. I know that 76th St North was considered to be Turley when I was young. Perhaps someday I can locate more information on Turley. Turley is now mostly boarded up and a fire has destroyed the old post office building. Turley School, or Cherokee as it was called when I attended, is located on the East side of Peoria between north 61st & 62nd streets. Ever few years there is an All Classes Reunion held for Turley School and many of the old students come back to visit. Such a reunion was held in 1983 and Bob Cooper of the Turley Lions Club produced a booklet with the history of the school and photos of many people who attended the 1983 reunion. The following is Bob's article on the history of Turley School. If you are interested in any of the photos found in this little booklet please let me know and I'll scan them in and send them to you. The paper the booklet is printed on is old newsprint paper and it is very yellowed with age so the photos aren't the best. Front page: "We may have vowed many times, if we ever got out of Turley we would never return. Most of us, at one time or another, thought those who were products of Turley School would be less likely to succeed in this world. Now, years later, our minds wander back to Turley and our school days there. We can see that many of us left Turley and traveled the world over. Many have held high offices in our nation. We can see that a great percentage .. went far. Turley School did produce some very good Americans. We remember with much fondness our first sweetheart, our classmates, our teachers. Out of old "Turley Cherokee School" comes loving memories that neither gold nor silver can buy. Now we take you ... Back to School At Turley! As a person gets into extensive research on a subject, he finds his respect growing for it. I found that especially true in my research on Turley. My feeling is that of increased pride to be able to call Turley My Town. No other town could be a better example to describe the struggles of the county's pioneers, the problems of the depression period, or the patriotism during War. No other school produced better citizens for its nation than Turley. In the early 1800s, the missions that moved into the Indian lands of Oklahoma played a big part in establishing schools. There are records, (recollection of oldtimers) of several schools in this Turley area prior to the one established at 61st street and north Peoria: Calvin Meeks attended a mission school located at about 38th and Lewis north. Mrs. Lena (Kisling) Doebler attended a school located at 86th street north and Midland valley tracks. 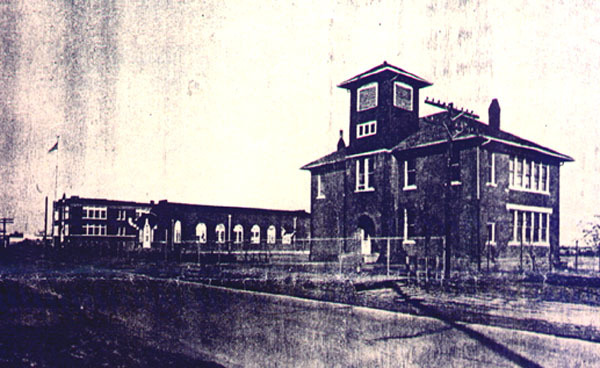 H H Bussman (Pete), attended a one-room red brick school at 76th street north and Peoria. Another school was located at 61st street and north Lewis. All these schools were before the one established and spotlighted in this paper. Known as Turley school by early students - or known as "Cherokee" by students who attended later. Covering the period of 1908 through 1964 there are four buildings involved. The location is 61st street and north Peoria. The first building on the site was located on the front southwestern corner of the land. It was a two-story, four-room building constructed from rock, year 1908. In 1920, the second building was constructed on the front northwestern corner of that land. (Referred to as the high school building). It was a two-story red brick building. Four rooms up and four rooms down and a full basement. The upper southeast room had a fire escape. A slide. (Jack Ready remembers it as being 42" inches in diameter). Also in the same year or maybe 1921, a gym building was built. It was located half-way between the other buildings. The school operated as an independent system from 1908 to 1933. Grades kindergarten through twelve. In 1934 it joined the Tulsa system. 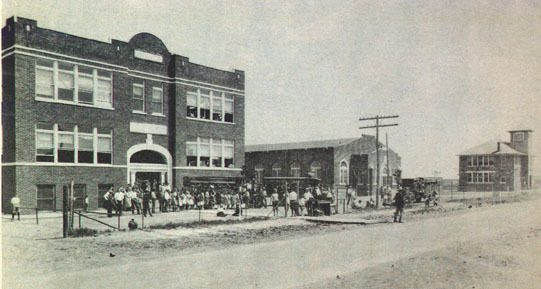 In 1934, another building was constructed south of and toward the back part of the gym and extending over to the property line to the south. It was built of white brick. That same year the old two-story rock building on the front south end was torn down. Turley school was now just a junior high school, kindergarten through ninth grade. 10th, 11th and 12th grades were bussed to Tulsa Central High School. A contest was held to re-name the school. The name "Cherokee" was adopted and still remains. Cherokee school continued on then as a junior high until 1964. Beginning in 1965, Cherokee was reverted to an elementary school. Kindergarten through 6th grade. Going back to the early years of Turley school, one can see the many inconveniences. At first there was no cafeteria system. Lunches were carried from home by the children in small lard pails. A number of lunches were carried in paper sacks. (The same sack being carried day after day until it wore out). Some lunches were wrapped in newspaper while others had a lunch of nothing more than a biscuit sandwich carried in the pocket (unwrapped). The cafeteria was installed about 1921. Minnie (Corley) Hallen worked in that cafeteria during her high school days for her lunches, '21 thru '24. Mrs. Earl was the first cook or director of the cafeteria and later Mrs. Pray. The cafeteria was in the basement of the high school building. During the depression, about 1934, Mrs. Sloan, (who was with the Tulsa cafeteria system for close to 30 years), recalls an alternate lunch room placed in a building across the street. Children unable to afford the 10 cents a day for a plate lunch could go there and eat free. Free food was supplied by a WPA kitchen, W. Tulsa. I was also unable to get an exact date as to when the school bus system was started. Some students recall it as far back as 1923. In 1933 there were three busses. Two Willis-Knights, and one Ford. A new Ford was added in 1934. Some of the names remembered in the bus system were Oscar Hudson, (driver); Shorty Bell, (driver); Mr. Baker, (driver); Earl Browning, (mechanic & asst driver). There was also a Mr. White, engineer, custodian and asst driver. Hard times were not limited to the pioneers or the depression period. The second World War saw many of the boys being drafted into the armed services. Turley was shocked and saddened by the news of the first two boys to be killed in that war, James Rowland and Jack Smiley. Later the VFW established a post in Turley and named it the Rowland-Smiley post as a memorial. Many lost their lives in that war. It was rough on the war front and also back home. The girls of Turley also played an extremely important part in the war. Many volunteered in the armed services. Some in the nursing field, some in the USO services, and a number of them worked in defense plants. The morale of those away from home were kept high by the many letters, news letters, etc., of those back home. But even when the war was over there were many problems. The boys returned, (now men), many without their high school education. Many went back to school to finish their education. Many married and went to work raising a family. Some settled down in other states. The war had scattered Turley school students throughout the world. Today you can see the product of Turley School holding offices in high places. Over the years former students of the school would run into each other. From time to time there would be a class reunion. It seemed as though the old Turley School had been somewhat forgotten. That thought disappeared this past May when I attended a reunion. Almost two years ago, a couple of former students got together and began planning a reunion. Gary Jones and Jackie (McClure) Chase had long dreamed of an all-out reunion, and they set out to make that dream materialize. The reunion was to cover 56 years. Anyone who had ever went to Turley "Cherokee" school during the period of 1908 through 1964 was to be contacted. The closer the '83 reunion came, the bigger the committee meeting became. The last meeting before the reunion saw over 50 people in attendance. It was a surprise to all to find that over 1200 former students and teachers had attended the April reunion. As you look through the pages of this paper, it is hoped the photos depicting the various periods of the school years will bring back fond memories. Speaking for the Turley Lions Club, it is hoped you will enjoy this years paper as we help you look back. The following is information found scattered throughout the rest of the booklet. Announcement Rowland-Smiley Post No 9077 VFW: The Turley VFW Post was organized on October 23, 1958, named in honor of the first two boys killed in action in World War II. They first met in the Odd Fellows Hall until 1963, when land was bought on the corner of 61st street and north Utica. Ladies Auxiliary was organized on Jan 29, 1959. First commander was Dallas Caffey and first auxiliary president was Margie Ridge. The Post & Auxiliary meet the 2nd Tuesday of each moth, 7 pm. The 1983 officers are: Bill Spicer, Commander; Charlotte Garvin, President; Ruby Caffey, Aux. Treasurer; Jim Reed, Quartermaster and Dudley Britton, Service Officer. Photo of Gary Jones & Jackie (McClure) Chase: Gary Jones and Jackie (McClure) Chase are the two who got the big reunion going. At first it seemed like a dream or something so far out to ever become a reality. After we got into it, it was like we were creating a monster. And monstrous it was, over 1200 former students and teachers were present at the First Turley School Reunion. The next all-out reunion will be in 1985. "It was a labor of love", said Gary and Jackie. Story by Elsie Rains: It was the first day of school and everything was confusing as usual. Teacher Elsie Rains said to one of her students: "Bill, you sit here for the present". Bill sat there being very quite throughout the day. After school was dismissed for the day Bill came to Elsie and said: "When am I going to get my present"? Photo of audience (all seated): Reunion '83: Waiting for the assembly to start Saturday afternoon. The theme was "Looking Back", headed by Elsie (Heft) Rains, former student and former teacher at Turley. Overheard: The school reunion dance was in full swing. An attractive redhead was the center of attention. One bystander said to another: "I understand she is celebrating her 18th birthday"! "Why not", said the other, "Better late than never". Photo of Welcome sign: Welcome sign placed in front of school. Looking north upper left hand corner the old "Cotton" Cullison Grocery store .... still standing. Photo: Turley's First Graduates as a Member of the Tulsa System <The Tulsa Tribune, Tulsa, Oklahoma, Sunday, May 13, 1934>. Members of the class of 1934, Turley high school are: pictured from left to right on front row: Ola Barnett, Dorothy Hogues, Juanity Dye, Nadine Barbee, Wratha Hudson, Lelabelle Gilland, R A Harris, class sponsor. 2nd row, Floris Barnes, Kenneth Wells, Hubert Hensley, Cecil Shell, Elsie Hoft, Luther Campbell, Willemina Verls. Top row, Everett Robison, Chester Smock, Athel White, Herman Moore, Winton Hendrickson. Not in photo is Joe Greenwood. Photo: 1940's - war years - on leave Bert Brazeal in Navy uniform with Lavern Davidson. Slick '39 Ford in background.